Even As It Heads Home, Aircraft Carrier Plays Key Role Fighting ISIS : Parallels Part of the U.S.-led coalition against the Islamic State in Iraq and Syria is seaborne. The Navy's USS Truman has been in the Persian Gulf but now is in the Mediterranean, on its way home to Virginia. 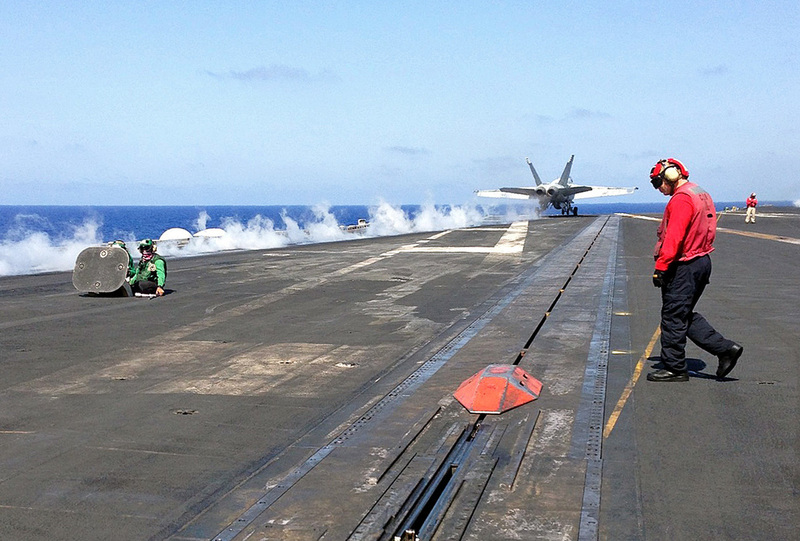 Flight deck crew members position F/A-18 jet fighters for a launch from the USS Truman aircraft carrier stationed in the eastern Mediterranean. The crew members wear different colored jerseys to identify their tasks. Stretching more than 1,000 feet, the flight deck of the aircraft carrier USS Harry S Truman is as long as the Empire State Building is tall. 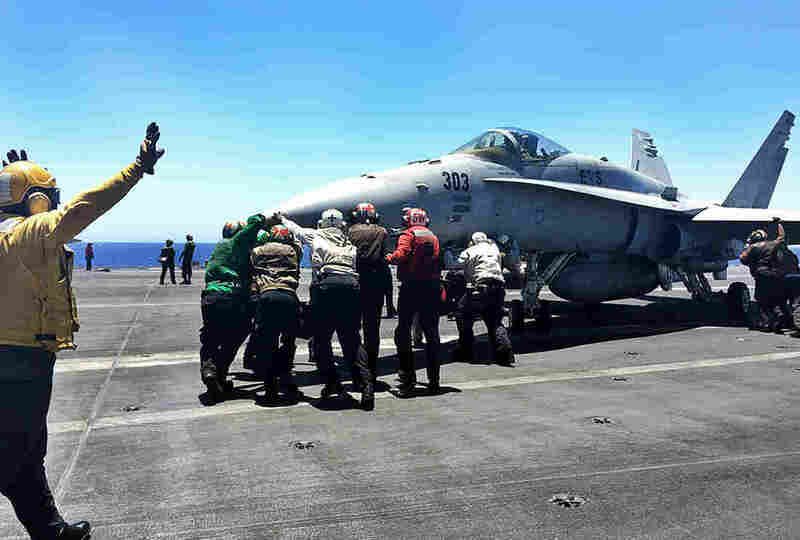 A voice on a loudspeaker shouts, "Launch the tanker," and visitors are treated to an ear-splitting spectacle as one after another F/A-18 Hornet jet fighters are catapulted off the deck into the sky above the eastern Mediterranean. On deck, communication is through hand signals. The colors of crew members' jerseys indicate their tasks: purple for fueling crews, red for ordnance, yellow for those who give directions to the pilots. With more than 70 tactical and support aircraft and between 80 and 85 sorties to Iraq and Syria a day, there is nonstop activity. "It's kind of coordinated chaos out there," says flight deck controller Chad Clark. He compares his job to that of a quarterback. "You coordinate everything that is going on the flight deck," he says. "You've got your teammates that are on the field and they execute the plays, you're the offensive coordinator, you coach, tell them where to go and they are out there executing the mission, out there on the flight." For nearly two years, the U.S. and its coalition partners have carried out Operation Inherent Resolve. This has steadily chipped away at Islamic State strongholds, though the group remains entrenched in many areas and still holds important cities in both Syria and Iraq. President Obama says the mission is making progress, though some critics in the U.S. have called for a more intense campaign. And aside from the military effort against ISIS, there is no political solution on the horizon in either Iraq or Syria. 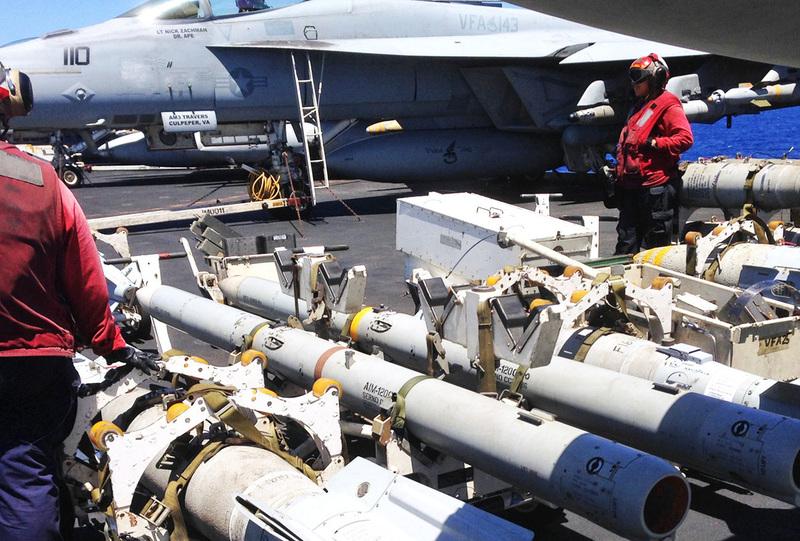 USS Truman flight deck crew members in charge of ordnance prepare to load warplanes. Since December, aircraft from the Truman have unleashed more than 1,400 bombs on ISIS targets, and the airstrikes continue even as the aircraft carrier heads home after a seven-month deployment in the Persian Gulf. The U.S. and its allies have launched some 10,000 airstrikes against ISIS from bases throughout the Middle East since the summer of 2014. In addition to the Navy strike aircraft that take off from the Truman, the Air Force launches fighters and bombers from bases in Turkey, Qatar, Kuwait and the United Arab Emirates. The nuclear-powered Truman has some 5,500 crew members and many crew members work 16-hour shifts, seven days a week. The ship was supposed to be heading home now to Norfolk, Va., but the Navy announced May 1 that it had to extend deployment. So the Truman has continued to launch airstrikes against ISIS in Syria and Iraq until another aircraft carrier, the USS Dwight D. Eisenhower, arrives to relieve it. That ship sailed through the Straits of Gibraltar and entered the Mediterranean on June 13. Capt. David Little, commander of the air squadrons, says the Truman's move into the Mediterranean, where it entered on June 2, was meant to send a signal. "Being here is important," he says. "It shows our coalition partners we have flexibility to maneuver, to operate where we are needed and we have the ability to execute from the Mediterranean while doing other operations here as well." The move coincided with NATO military exercises in Eastern Europe and an upcoming NATO summit in Warsaw that could raise tensions with Russia. Officials in Washington indicate the Truman is in the Mediterranean also to keep a check on Russia, which has 10 to 15 ships in this sea. Little says there's a memorandum of understanding with Russia to help keep the nations' ships and aircraft safely apart even as each tries to send a message of strength. "There are specific rules of engagement as far as separation, staying away from each other, to allow us both to do what we are here to achieve without the potential for any miscalculations or any escalation of tension between countries," he says. The missions launched here against the Islamic State in Iraq and Syria are pretty much the same as those from the Persian Gulf, ship officers say. "We have taken back about 45 percent of the populated land in Iraq that ISIL once controlled," says Rear Adm. Bret Batchelder, commander of the Carrier Strike Group. "Yes, I feel like we are getting the job done." Cmdr. Jim McDonald is known as "Gun Boss" because he's in charge of ordnance. Fighter jets from the Truman, he says, have dropped on ISIS targets more smart bombs — GPS- or laser-guided munitions — during this deployment than from any carrier in any previous U.S. deployment. He's vague about the specific targets, saying only: "Anything that might hurt them personally, psychologically or monetarily." But the air war against ISIS is not being waged just with smart bombs. Flight deck crew members prepare to clean the deck of the USS Truman for the next warplane launch. Along with fighter jets, the hangar below the Truman's flight deck is filled with Seahawk helicopters and EA-18G Growlers — which specialize in electronic warfare. Naval Flight Officer Lt. Kali Billings says her main task on Growler missions is jamming ISIS communications to assist the pilots carrying out airstrikes. The Growlers and Marine Corps EA-6B Prowlers can monitor ISIS radio and electronic communications or jam them, keeping the terror group disorganized and preventing its leaders from giving instructions to troops. "We add kind of another level of lethality in terms of our strike fighters can go out there and bomb things, and then we can manipulate the surrounding areas in terms of how people are talking to each other or denying that and just adding to the chaos of a very strong moment," Billings says. Before leaving the ship, this group of visitors is treated to a transfer of command ceremony. The commander of the Fist of the Fleet squadron is retiring; he and the new commander fly their jets over the ship and salute each other, as white flares shoot across the clear sky. Standing on the control tower above the flight deck, the clear singing voice of logistics specialist and squadron member Kadijah Burton envelops the flight deck. The notes of "America the Beautiful" bring the ceremony to a close.